A UK education constitutes a great stepping stone for your future – an investment in opportunity, career advancement, earning potential and personal development. 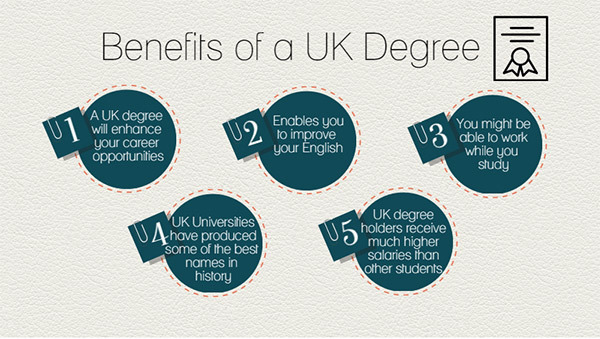 A UK degree will enhance your career opportunities because UK degrees are recognized around the world. UK degrees enable you to improve your English which is the global standard in regards to business communication. You might be able to work while you study too. World famous for scientific research and discoveries, UK universities have produced some of the best names in history. UK degree holders, on average receive much higher salaries than other students. UNICAF scholarships provide opportunities for studies towards various distance learning degree programmes. The University of South Wales offers a distinctive advantage for students who study online as they earn a highly valued Internationally Accredited UK Degree.